I was inspired to make a blazer similar to this one, except made by GAP. I bought a cute navy and white stripey ponte knit from an online vendor. Sadly, I didn’t realize I was buying by half a yard and not a yard (don’t you hate when that happens! A big bugbear of mine. Silly, Mela) and didn’t have enough. So enter the lovely Victoria blazer. I wasn’t sure the boxy silhouette would suit me but I figured, what the heck, let’s find out! Being pressed for time these days, I decided not to do a lining. I finished the collar and lapel edges in green bias binding and simply folded the hem under and stitched. Ta-da! Easy breezy. Based on the finished shoulder measurement, I traced size 14/18. I still found the blazer a bit too wide and will have to take in the pattern by an inch or so at the shoulders. For the sleeve I added 1 inch using the slash and spread method, and 1 inch to each side, so 3 inches in total. To the back and front pattern pieces I added 1 inch to the armscye width. I also interfaced the collar, lapels and cuffs. For a cleaner look I tacked down the lapels. Forgive my weary eyes in the side profile photo above. With the days getting darker earlier the best time I can get photos taken are before G leaves for work so that meant rushing to get dressed and forgoing my morning brew. I’ve only matched stripes twice before, one by luck and the other was a basic skirt. Nothing to brag about. This time I took my time laying out the fabric and pattern pieces and cutting them out in one single layer. It helped. I think the only place the stripes failed to completely match were at where there’s some excess sleeve ease business going on. So I’d like to think I did an okey dokey job there. But I will save my bragging rights for the day I match plaid. Yes, ma’am. With the year quickly coming to an end (I know, I’m totally a bit ahead of myself) I’d like to say that this jacket is fulfilling my Sewlution! Sure it’s not the lined, fitted glory of a blazer I had in my head when I made the sewlution, but it is a blazer. And let’s be frank, I can’t be certain I can make a fitted lined jacket before the new year. So yeah. I’m calling it: Sewlution accomplished! This entry was posted in By Hand of London, Muslin, Outer Garment, Sewing Success and tagged Armscye, bhl, Blazer, by hand london, jacket, Sew, sewing, sewlution, stripes, Victoria, wearable muslin. Bookmark the permalink. ← I’ll have a slice…oh well..let’s make it two! This is an awesome Victoria. 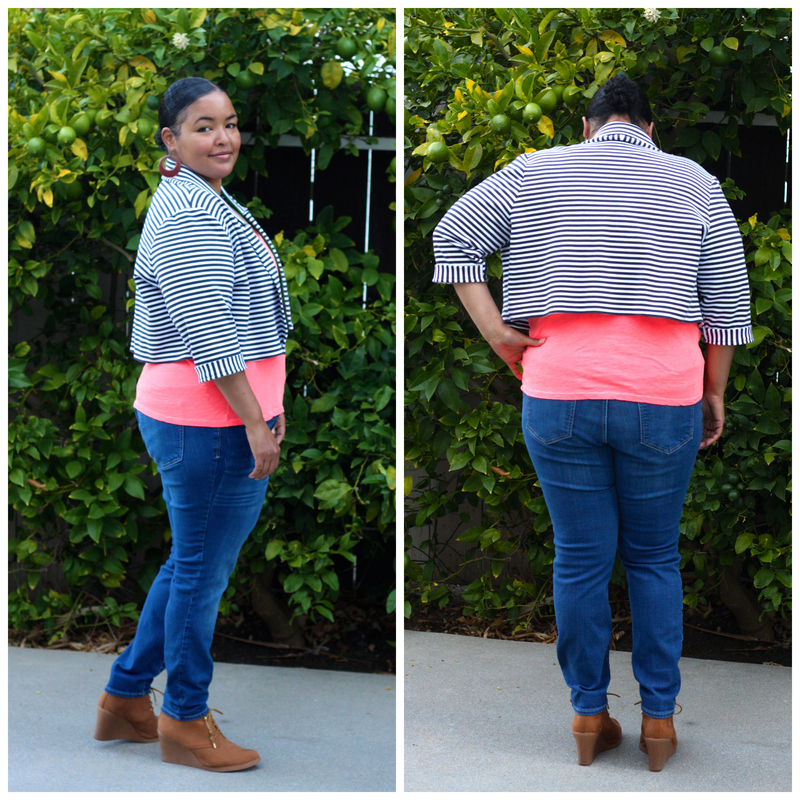 I’ve been a bit undecided about the short style, but love it in stripes! Thank you! The cropped version was kinda decided for me since I didn’t have enough fabric for the longer one. I do like it but I will be making a longer version. Very nice Mela! And it really suits you too! I like the idea of seeing when you can – it must totally ease the guilt. Thanks Mandy. It really does the guilt. No guilt means more fun! Oh wow! I love it – the stripes are fabulous. This is darling, and all from 1/2 yard of fabric! Nice job on all of it! Thanks! It was actually 1.5 yards instead of 3. If I could manage a garment out of half a yard I would totally have to celebrate. You postponed your coffee for us? That’s so sweet! I love your stripey Victoria; it is almost seasonless. Also, cute boots! This is just Lovely ! I like yours even better than the Gap one ! Your jacket is so cute. You’ll get to wear that with a lot of things. Thank you. I definitely think it’ll be a great go-to garment for this fall. It’s totally annoying. Especially when the fabric is a knit and not a quilting cotton. Oh well. I guess it teachers me not to rush an order and to read before pressing the buy button. I absolutely love this! 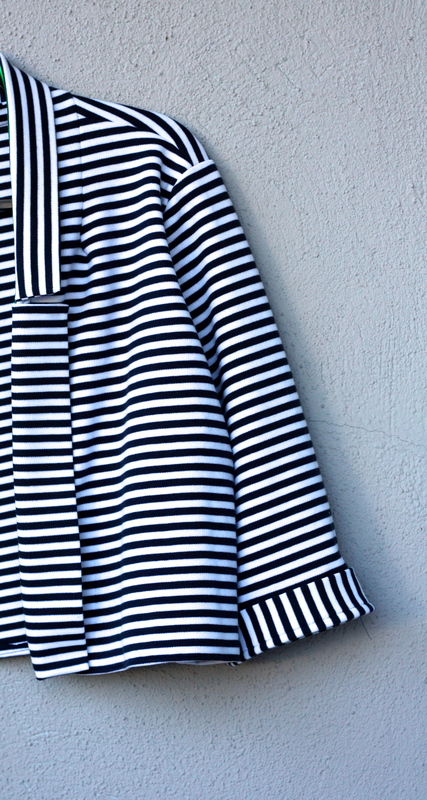 The way you have the stripes going in different directions on the cuffs and collar really makes the jacket. And it’s awesome that it’s unlined – you may think it’s a cheat, but to me, using bindings is a scary thing I have yet to do! You look fantastic in this jacket, even if you didn’t have your coffee yet! Thank you Gail! The binding worked so I’m happy. I so didn’t want to cut out a lining. But the next one will be lined. I look forward to seeing how it affects the fit and look. I imagine it will hang differently. This is adorable!!!!! I love it on you! 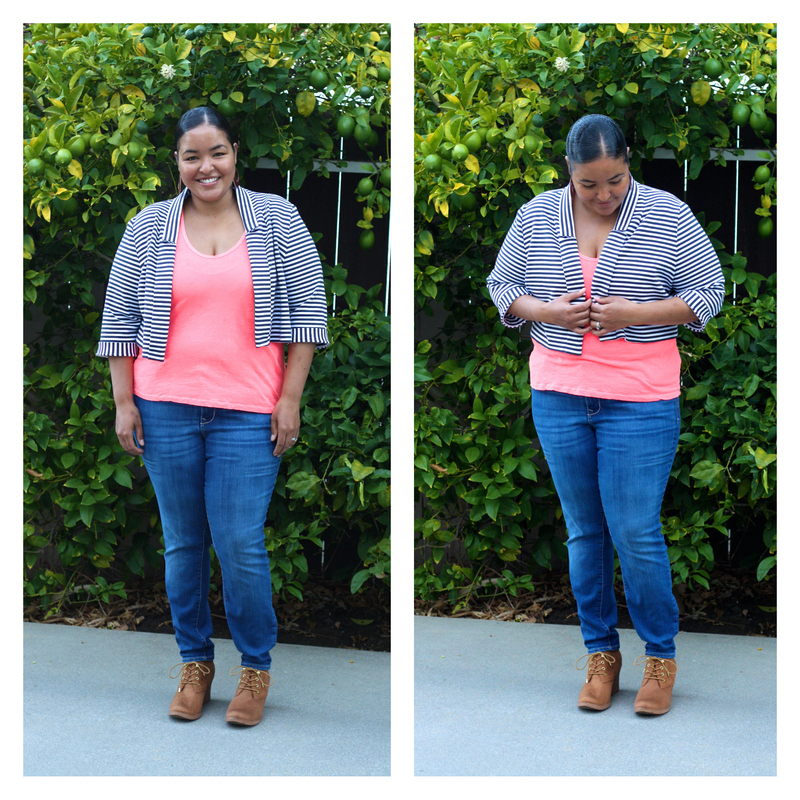 Looks like sewing in little bits and pieces is totally working for you! The little spurts of sewing is definitely working for me. It feels good to actually be doing it rather than daydreaming about it (although I do enjoy that too). I learned the tacked down tip from Dixie DIY. A lot of people’s complaint about the jacket seemed to be that the lapels were floppy so hence the tacking. Worked like a charm. Sewing in bits took some getting used to but I found it nice to walk away from an unfinished project. I returned refreshed and excited to get back to it. I thought I would hate it. Yeah, I wasn’t sold on it initially but the more versions I saw the more convinced I became. I’m glad I took the leap and got it. It was fun to sew. Wow! Having the patience to match stripes! Amazing! And the hard work paid off. It’s beautiful! It definitely took a bit of head scratching but totally worth it. This is absolutely smashing, Mela! And the shoulder seam chevrons are epic! this is gorgeous! I feel the need for a stripey blazer in my wardrobe too. And you are looking fantastic!!! Thank you. My guy doesn’t sleep well so I don’t sleep well. That compliment means a lot. Thank you. I hope you, baby, hubs and the house are doing great! Way to go – the most flattering Victoria of all! The stripes are awesome, and the cut really suits you! Thank you Chloe. That means a lot. Who needs Gap when you can sew such a cute jacket. That’s the Sewlution absolutely nailed! You look adorable in this. Thank you! Making the jacket saved me tons. It feels nice to get/make what you want for less. This is super cool Mela and I love the cropped length on you! Truly well done, love everything about it! Thanks Marie! I hope things with the house are going well! This is my favorite Victoria! Super cute – I have been on the fence about this pattern for a while and also unsure how the boxy shape would work on my curvy one. It looks great on you and I love the stripes! Your blazer look fabulous. I’m sure you will get loads of wear from this one. 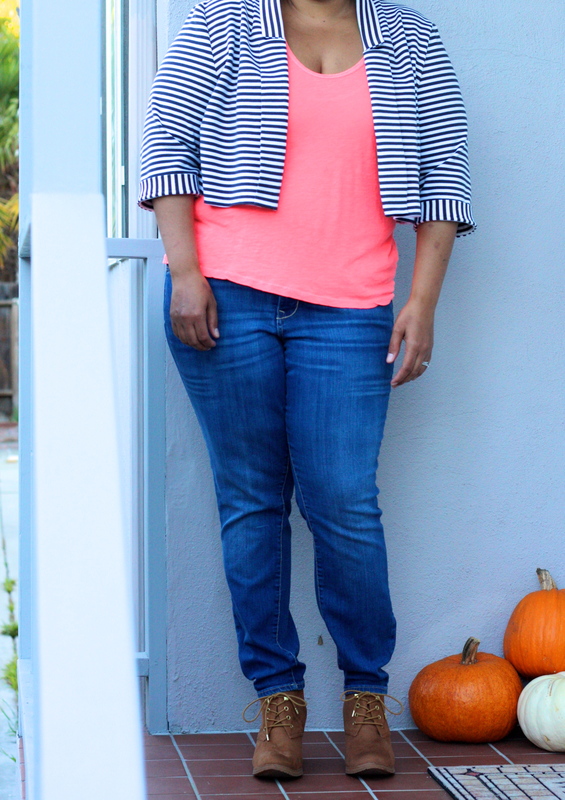 Any stripe matching is my books is pretty damn awesome – I try and avoid! Thank you. I always tried to avoid stripe-matching as well. Figured it was time to take the plunge! I actually kinda enjoyed it. Ooh, nice! I bet that cropped length will look fantastic with dresses. Love the play with the stripes. This is my favorite Victoria I’ve seen-so chic! Love, love, love it and it looks fabulous on you!! Even though it’s striped, I can see this really being a basics kinda clothing item. Thanks Jill! I’m with ya. I totally see it being paired with quite a few outfits in my wardrobe. Fab Victoria Blazer!! I l.o.v.e. it in stripes, I reckon it’s perfect!! It looks fresh and comfy and I bet you’ll wear it lots. Great make!! Thank you Winnie. I am very much a sucker for stripes and this project helped me get over my fear of working with them. Yay! I love stripes. Always have. 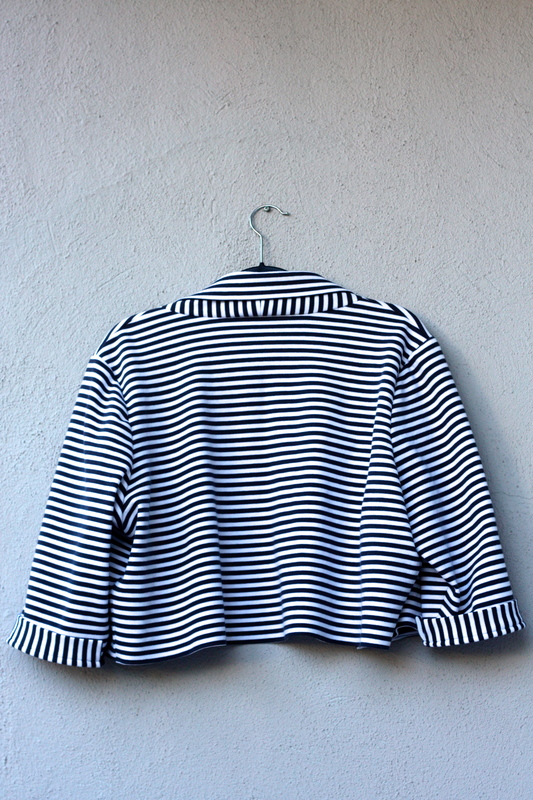 If you make a striped knit blazer we can be twinsies. 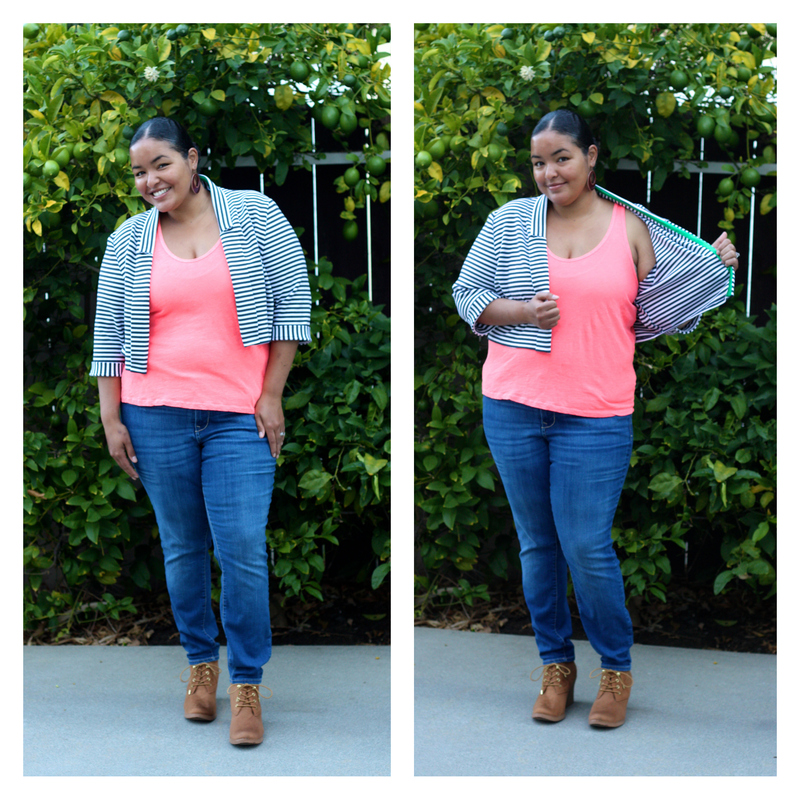 Wow, this looks great on you and I loved the way you styled it color-wise with the pink top! I had my reservations about this pattern because of the boxy shape you describe, but after seeing it on you, I may just have to order it! Thank you! I am reconsidering the Georgia dress after seeing your lovely red version. Wow, thank you, I am happy to hear that. Pingback: The Monthly Stitch March Challenge | Is it fitting? Fab jacket! Yeah only do bit by bit and you will feel so productive. I just say right I will so those two side seams then go about my business. Another day I will say I will just insert the zip etc etc. At least the project is moving along. You will always find time to do something little like ok, I will just pin those sides together.